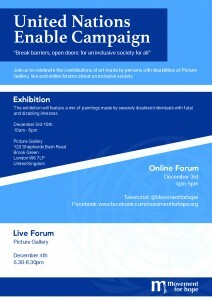 Neurological conditions are the leading cause of disability worldwide so we are pleased to be joining United Nations Enable for this year’s theme: “Break barriers, open doors: for an inclusive society for all” on December 3rd, 2013. Join us to celebrate the contributions of art made by persons with disabilities as agents of change and development in communities they live at our next gallery exhibition, followed by a series of forums. The exhibition will feature a mix of paintings made by severely disabled individuals with fatal and disabling illnesses. The artists featured have used use eye-gaze technology, acrylic on canvas and mixed media to create their work. Additionally, it will include elements of multimedia art with videos featuring the disabled participants to improve the impact of awareness-educate surrounding brain and spinal conditions. @MovementforHope to explore problems and innovative solutions for integrating persons with disabilities into societal and developmental plans. Following this, there will be a live follow-up forum on December 4th over an evening reception. We will also be holding an online Tweetchat to explore innovative means to by which persons with disabilities and their families can be further integrated into their societies and development plans.